Kate excels at the 35,000-foot-view, and gets organizations to ask the big questions: how and why are we doing what we’re doing? And she helps us wrestle with the answers. Kate gave us the tools to look at our work more critically, and to focus on the important, not just the urgent matters. We’re a different — and much better — organization now, because of her work. I have a dedicated Board who were struggling to organize as a cohesive team. Like many boards they take their responsibilities to the organization seriously and they value their relationships with each other. Sometimes their work requires engaging in healthy conflict and this was very difficult, but they were committed to developing their strategic thinking, discussion and decision making skills. Kate created the structure and safety for necessary discussion to take place, prepared us for and facilitated that discussion, and allowed all voices to be heard and vital decisions to be made. Kate leaves us with resources that are a foundation for our ongoing development, and she is available as trusted and knowledgeable sounding board for all manner of nonprofit governance issues. Kate was a great help to me personally as board chair and to the entire Rose Andom Center group. She sorted through confusion, kept us focused, provided guidance and reality check to our Young Professionals’ Council, helped us create a communications plan, led board development, met in person when coaching was needed – the list goes on and on. She provided a voice of experience and wisdom – we were blessed the day she decided to support our work. We worked with Kate to help us create and implement additional structure to our processes. She helped us identify our priorities, utilize our collective talents to achieve those priorities, and develop tracking measures to gauge our success. Kate was enthusiastic and professional and our staff and board enjoyed working with her. 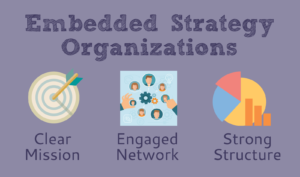 Kate’s approach centers around Embedded Strategy Organizations, where each organization reflects a clear mission, engaged network and strong structures.